In my previous post I revisited the topic about the signalling methods between the QML and C++ domains. Next I’m going to apply those methods by creating a simple text editor application. The editor should have just the basic functionalities to make it useful, e.g. The user can type text in an edit window. The user can save the file, open a new file, open an existing file and save the file with a new name. The user can browse the file system for opening and saving the files. The figures below show how the user interface looks like. On the left is the edit window with two toolbar buttons, one for saving the file and one for opening the file menu. 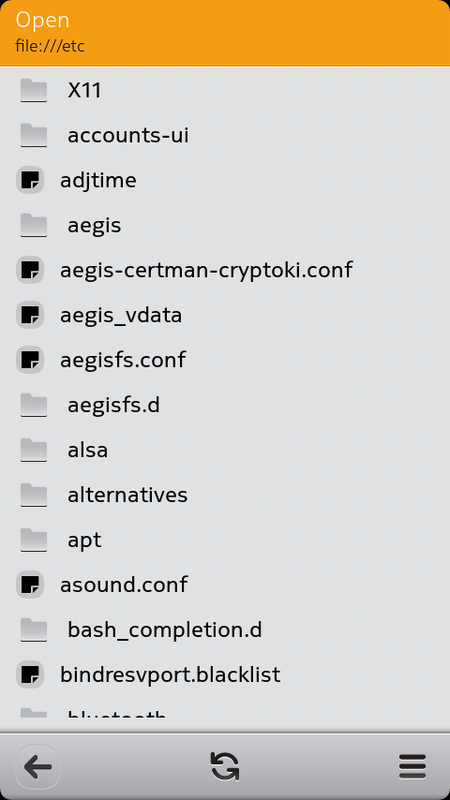 The figure in the middle shows the file menu. If Open is selected the file browser is displayed as shown in the figure on the right. The main.cpp source code is shown below. 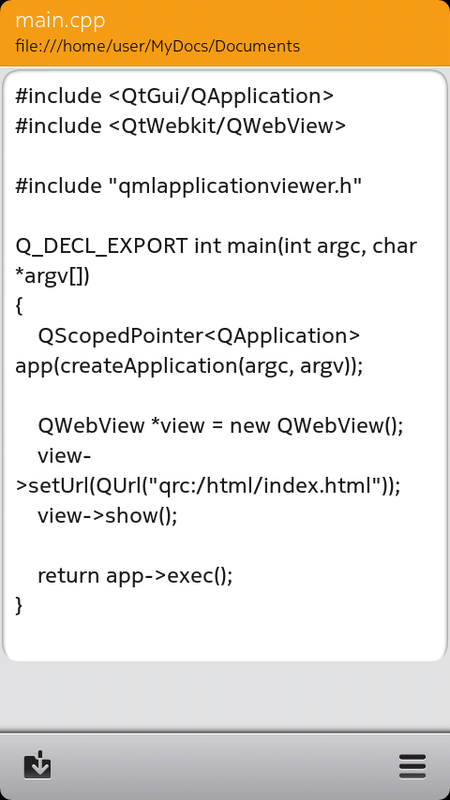 To avoid cluttering the main function with the connect statements I will pass a pointer to the QML root object to my TextEditor object. 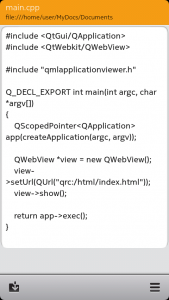 The TextEditor class contructor will then make the necessary connections between the QML elements and the signals and slots defined in the TextEditor class (to access the QML root object we need to include the QDeclarativeItem header). Finally the TextEditor class will be instantiated. I will pass the viewer object as the parent object to the TextEditor. This will make sure that when the viewer is deleted also the TextEditor will be removed from memory. var FONT_FAMILY_BUTTON = "Nokia Pure Text"
Property settings, like the UI constants. Signal declarations for passing information from the QML side to the C++ side (using slots). Signal declarations for passing information from the C++ side to the QML side. Note that as there are no slots in the QML side we need to connect C++ signals to QML signals and then use the QML event handlers to process the signal. QML element instantiations (like the edit page and the browse page). We will use the page stack to change the active page. Event handlers to process the signals coming from the C++ side (signal named “signal” will be processed by an event handler called “onSignal”). QML dialog elements e.g. to get confirmation for certain actions or to display error messages. 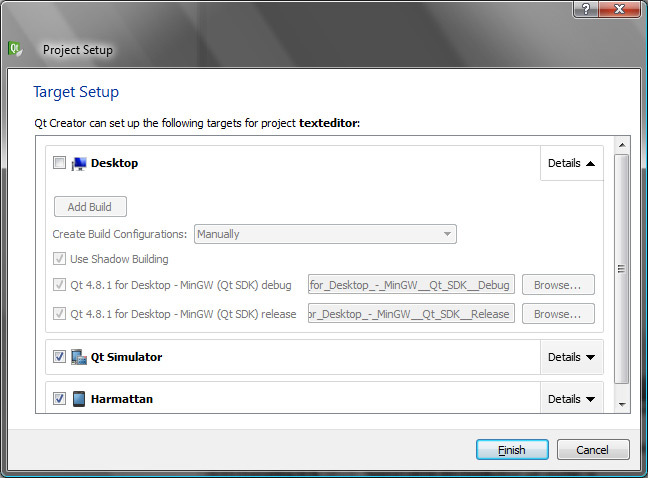 // Menu>Quit was selected but editor contents were not saved. // TextEditor could not open a file for reading. openFailedDialog.titleText = "Cannot open "+fileName+"." // TextEditor could not save the file. saveFailedDialog.titleText = "Cannot save "+fileName+"." // TextEditor successfully saved the editor contents to the selected file. // Go back to EditPage and flash "Saving...". // Was this the save as before close? // TextEditor successfully saved the editor contents to the current file. // Stay in EditPage and flash "Saving...". // Was this the save before close? // TextEditor successfully loaded the editor contents from the selected file. // TextEditor will ask before overwriting an existing file. 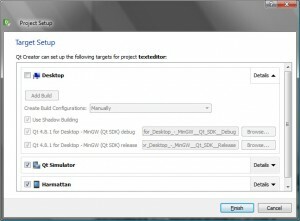 // TextEditor will ask before opening a new file when editor contents changed. // TextEditor will ask before starting a new file when editor contents changed. message: "Do you want to replace it?" The editPage.qml file contains the main editor page. It is defined as the initialPage in main.qml and so it will be the initial page stack page and displayed when the application starts. The page layout is pretty simple as shown below. On the top is the header (defined in Header.qml) containing the file name and the folder name. 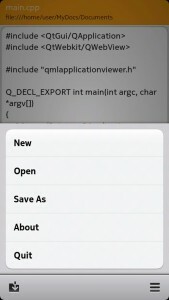 In the middle is a TextArea QML component (embedded into a Flickable element) that is used as the editor buffer. And on the bottom there is the toolbar (defined in EditTools.qml) that has two buttons: Quick Save and File Menu. Below is the EditPage.qml source code. To give some visual feedback for the save operation there is also a simple state transition that will shortly flash the word “Saving…” in the middle of the page. The transition will change the label opacity so that the word will eventually fade away (at the same time the Flickable element opacity will change to the opposite direction making the editor window visible again). // Change state from "saving" to "saved"
The file EditTools.qml defines the toolbar for the edit page. When the save button is clicked the signal menuSaveClicked is emitted and the edit page content is passed to the C++ domain. 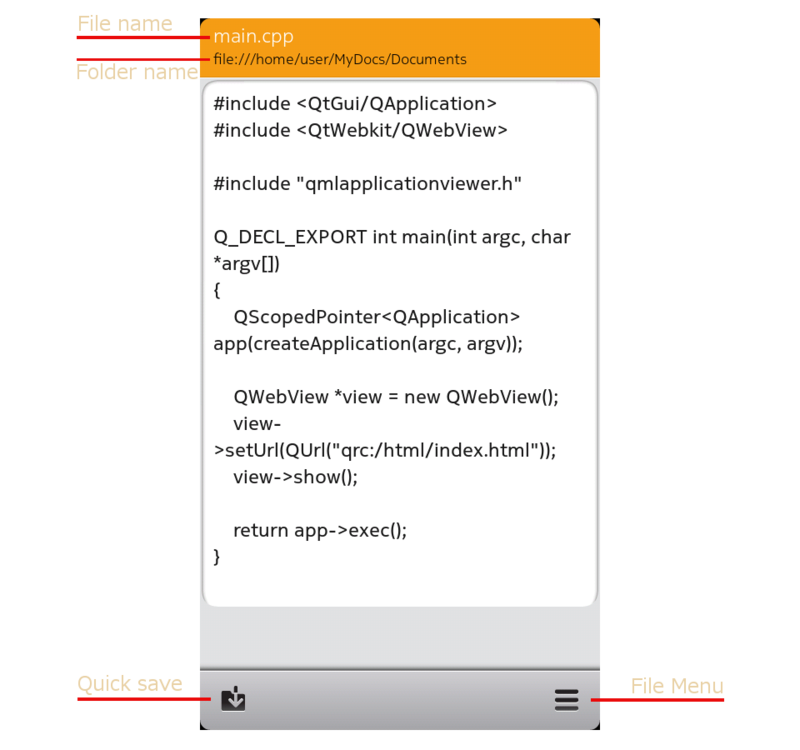 The menu button will open and close the file menu (the menu is defined in EditMenu.qml and instantiated in the main.qml file). onClicked: (editMenu.status === DialogStatus.Closed) ? 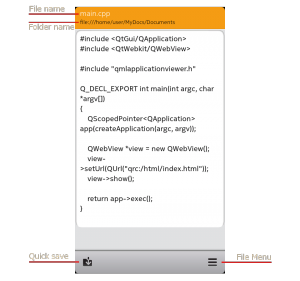 The edit page menu is defined in the file EditMenu.qml. Each menu item has an event handler onClicked that either emits a signal or opens a dialog (“About”). The signals are defined in main.qml and the connections are done in texteditor.cpp (in the TextEditor class constructor). For the File>New and File>Open actions we will pass the current editor content to the C++ side to check if the content has changed before loading new content. The Header.qml file contains the page header code. It is parameterized (using properties as a kind of API – see the highlighted section below) so that the header text can be easily changed. Also it is possible to switch between a single line header and a double line header. The header dimensions are defined in the appDefaults.js file. When the user selects File>Open or File>Save As the browse page will be opened (by pushing the browse page component to the page stack). The browse page will list the currently selected folder contents in a scrollable list. By clicking a folder icon will open the sub-folder. By clicking a file icon will open the file (or select the file as the “Save As” target). 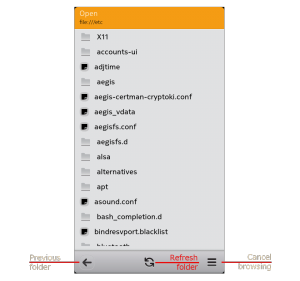 The toolbar contains a “back” button that will go back to the previous folder, a refresh button for updating the current view (e.g. when a new file has been created) and the file menu containing a “cancel” action for cancelling the currently selected operation and to go back to the editor page (by popping the browse page from the page stack). Below is the browse page source code from the file BrowsePage.qml. The page header is using the same Header component (from Header.qml) as the edit page. There is just one additional embedded button that is needed for saving files. Below the header is a TextField component that is only visible during the Save As action to enter a file name. The main part of the page is occupied by a ListView component that is using the FolderListModel to access the file system. The FolderListModel provides two roles called ‘fileName’ and ‘filePath’ that contain the currently selected file and folder names. They will be used inside the delegate component (FileDelegate defined in the file FileDelegate.qml). Finally there is a state transition similar to the edit page showing the text “Refreshing…” when the refresh button is clicked. // Change state from "refreshing" to "refreshed"
The FileDelegate component defines how the file list entries are displayed. The source code is in the file FileDelegate.qml. The delegate consists of an Image, a Text and an associated MouseArea. The current file name and folder name are provided by the FolderListModel roles ‘fileName’ and ‘filePath’, respectively. The property isDir selects whether a file or a folder icon will be shown. When the MouseArea is clicked a signal will be emitted (for opening the selected file or folder) or the TextField will be updated with the chosen file name (for Save As). The browse page toolbar is defined in the file BrowseTools.qml (and instantiated in the main.qml file). Here we just define the three toolbar icons and the associated actions (i.e. the onClicked event handlers). When the “back” button is clicked we will emit the folderChanged signal that will trigger the onFolderChanged event handler in the BrowsePage component to update the current folder (and also notify the C++ side with the signal currentFolderChanged). When the “refresh” button is clicked the BrowsePage component property refresh will be set to true which will further trigger the property transitions. 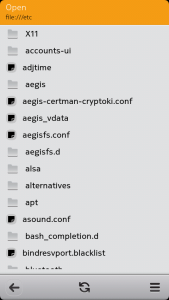 The transitions contain a temporary change in the FolderListModel nameFilters property which will force the FolderListModel to rescan the current folder. Finally the “menu” button will open and close the file menu. onClicked: (browseMenu.status === DialogStatus.Closed) ? 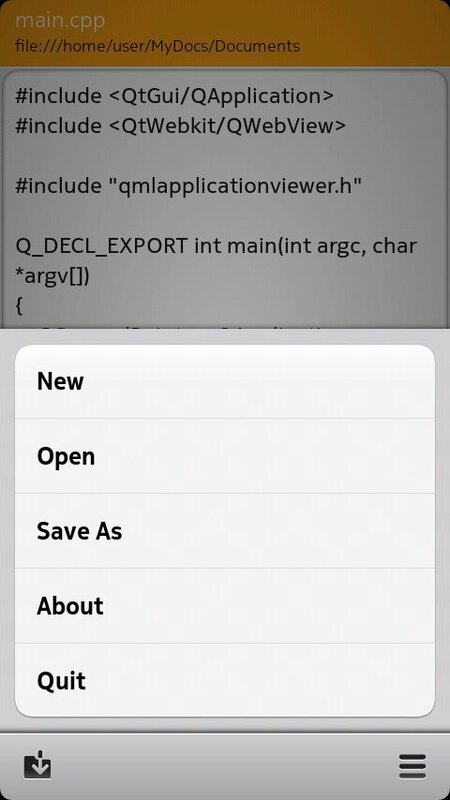 The menu is defined in the file BrowseMenu.qml (and also instantiated in the main.qml). The only entry in the menu is “Cancel” that will cancel the current operation and return user back to the edit page. This concludes the QML user interface code. What is left is the C++ back-end. The C++ back-end consists of one class called TextEditor. The header file texteditor.h contains the class declaration. Here we just declare the member variables, the slots and the signals. Each slot and signal has a counterpart in the QML side. The file texteditor.cpp contains the TextEditor class implementation. Here we define what the slot methods do. In addition the class constructor will connect the slots and signals to their counterparts in the QML side. The QML root object is passed to the constructor from the main.cpp file. // Overwrite during Menu>Save As was confirmed. // Discard current content was confirmed during Menu>Open. // Discard current content was confirmed during Menu>New. // QML menu: Quit was clicked. // Check if the content was changed. // Not changed -> ok to quit. // Saving changed content before quitting was confirmed. // Did we have a valid file name? // Save the current editor content to the current folder/file. The version presented in this post should correspond to branch-v1.0. 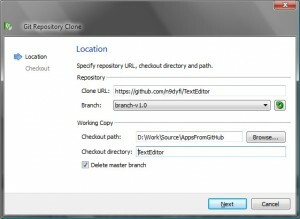 In QtCreator you can open the project directly from Github by clicking the Create Project button and selecting Project from Version Control and Git Repository Clone. Then fill in the Clone URL and Branch as shown below. Finally select the targets and you are ready to go.